Here at Media Managers we don’t have a nominated charity, but we always enjoy getting involved in charity events. Whether it’s finding our festive favourites out for Christmas Jumper Day or answering emails with our red noses on for Red Nose Day, we love giving it a go. Recently, I did something a little bit different for charity. Rather than the traditional run or sponsored bike ride, I cut ten inches of my hair off and donated it to the Little Princess Trust. If you’ve not heard of the charity before, the Little Princess Trust provides real hair wigs for children who are suffering from hair loss due to cancer treatment or other illnesses. 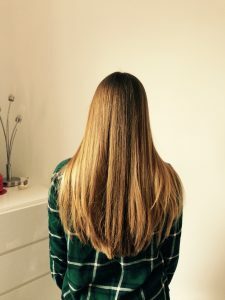 There are guidelines surrounding hair donations such as the length of the donation and the colour and condition of your hair. Knowing that my hair was suitable, I decided to book an appointment at a local hairdressers and go for the chop. 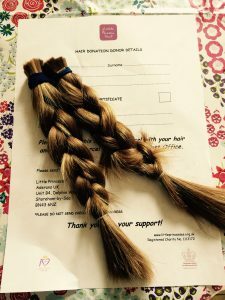 Once my hair had been plaited and cut, I sent it off to the Little Princess Trust. From there, my hair will have been sent to a wig making factory in China to be blended with other hair donations of a similar colour and length to mine. By now, a poorly child will have been provided with a new wig to wear and a boost of confidence. I may be missing my longer locks but I’m sure that they’ll grow back quick enough.